Maxima 620 tender is completely new in form and layout. The fast sailing tendersloop hit from 2019. A sleek smooth hull with an integrated rope fender and an integrated swimming platform. 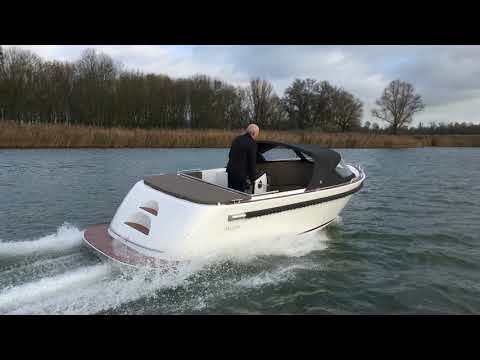 Maxima 620 tender is completely new in form and layout. The fast sailing tendersloop hit from 2019. A sleek smooth hull with an integrated cabling and an integrated swimming platform. Chic steps in the back of the boat. Standard a stainless steel strip as protection for the bathing platform. The swim platform is ideal if you want to swim, but it also offers protection against the propeller of the motor. The swimming platform is also very useful for boarding and disembarking. Because the engine is mounted in the bun, this ensures a huge noise reduction. So enjoy the tendersloop. This sloop is also fast-moving, the underwatership is extremely suitable for this and with up to 60 hp of power, your sailing area is a lot bigger. But also the slow sailing makes this boat excellent. stable, stable and good visibility ensure that you feel extremely comfortable while sailing.